Kid-size slings encourage a sense of nurturing. 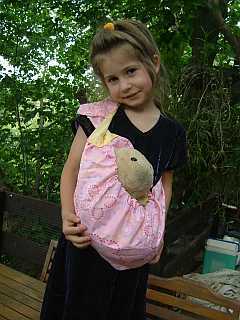 Other uses include a carrier for treasures found at the beach and on nature walks. The images below show in stock Kid-size slings. If you would like a different colour combination of fabrics for your Kid-size sling, please email me and I can make one specially for your child. 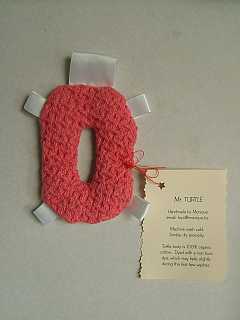 Note that these make wonderful gifts for the older sibling of a newborn sling-carried baby. 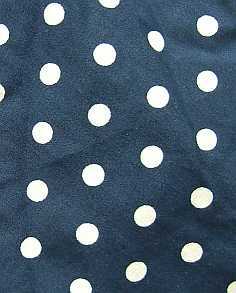 Navy blue dots on the outside with rich navy lining. Retro pastel design outer sling with gorgeous red lining. These cotton bodied tag toys are machine washable in cold water and may be tumble dried. Contact me if you would like dragonfly or turtle toys made up according to your requirements. 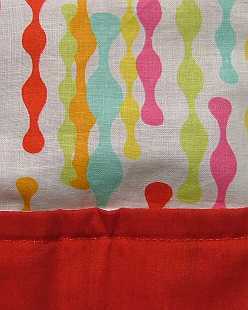 I have several organic cotton fabrics to choose from, though unfortunately no more textured fabrics like the one shown below. 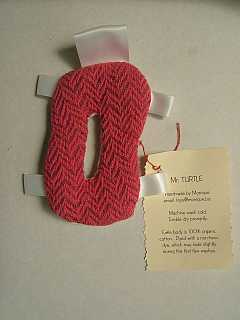 Turtle with organic cotton red weave body. Pocket sized knitted toys - highly portable to encourage imaginative play anywhere. Please note that your mermaid will be made upon receipt of your order. No two will be exactly alike and some customisation in terms of colour of eyes, skin, hair and tail scales may be made upon email request. I also make knitted and crochet finger puppets so if you would like to view others that I have made, please email me. 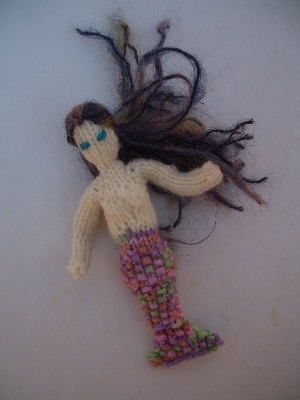 This small knitted mermaid nestles in the palm of an adult hand and tucks very easily into a child's pocket. She is ready to participate in imaginative play anywhere, any time. These ribbon wands, also known as ribbon sticks, are favourite toys for toddlers and preschoolers. They give hours of fun as children spin and dance and twirl and swirl with these ribbons flying behind them. Ribbon wands are made by my eleven year old daughter. 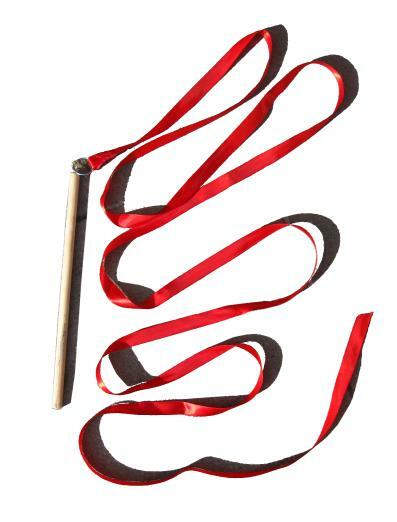 The wooden handle of the ribbon wand is 30cm long and the ribbon is about 3m. This is perfect for children up to about 125cm. Taller children may prefer a 4m ribbon. Ribbons currently available in blue, yellow, red and pink. Please include your choice of ribbon colour in a message in the shopping cart. If you have any questions about these items or would like to request customised items please contact us by email.